Full-duplex so all participants can speak and listen at the same time. This full-duplex phone allows for simultaneous two-way conversations. Clear, natural sound made possible by wideband acoustic echo cancellation and dynamic noise suppression, as well as phone-line echo suppression. 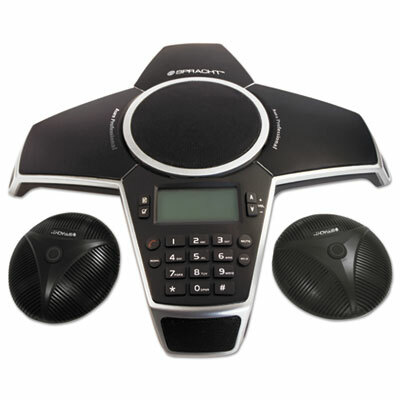 Available with six microphones, four internal and two external, with automatic, intelligent microphone mixing built in. You can store 20 numbers in the phone book and speed dial 20 groups. The three-line LCD displays Caller ID. The 5W speaker can generate volume up to 90 dB. The 12-keypad includes features such as: Microphone Mute, Call Hold, PSTN Flash and Call Redial. Click here to see more Telephones!